With almost 1,400 acres available for camping around Lake Tenkiller and along the upper and lower Illinois River, the Tenkiller area is the camper's paradise. With two state parks and many campgrounds that are privately owned or managed by the U.S. Army Corps of Engineers, there is room for everyone with a range of facilities from RV hookups to the most primitive settings of your choosing. The parks have boat ramps, restrooms equipped with showers, picnic shelters and tables, drinking fountains, swimming areas, playgrounds and grills. Handicap accessible sites are also available. Group camping areas are plentiful and packages may be arranged by calling any of the state parks or private sectors. Many family reunions, weddings, group retreats and corporate events are coordinated yearly. Special programs are also available through Tenkiller State Park's Nature Center. Be sure to call ahead for reservations, to arrange special programs for your group or to check on upcoming events. All lake swimming areas are protected from boats with safety buoy markers and most camping grounds are patrolled 24 hours a day by the State Park Rangers, Oklahoma Scenic Rivers Commission Rangers and the U.S. Army Corps of Engineers. The camping fees are reasonable, and there are several free public access areas along the upper Illinois River. Campsites for the U.S. Army Corps of Engineers parks and recreation areas can now be reserved by dialing toll free to 1-877-444-6777. Individual campsites may be reserved 240 days in advance, while group facilities may be reserved 360 days in advance. Reservations are not required but are recommended for holidays and peak season. For information on campsites not regulated by the U.S. Corps of Engineers, call the Tenkiller State Park at 1-918-489-5641 for state park camping or the Greater Tenkiller Area Association at 1-918-457-4403 for all privately owned campsites. Tenkiller Lake is the clearest body of water in Oklahoma. Nearly 13,000 acres provide ample space for a wide variety of boating activities that cover sailing, scuba diving, water skiing, wakeboarding, inner-tubing, fishing, cruising, lounging and jet skiing. There are several full service marinas on the lake that provide fuel, snacks, swimwear, water toys, and a few items that may have been dropped overboard. Four of the marinas, Simon’s Pine Cove, Barnacle Bills, Burnt Cabin and Sixshooter Resort, also serve as floating restaurants that allow casual dress straight from the lake. There are also several businesses and marinas that are available to assist any boater that experiences accidents or breakdowns. Refer to the business directory for our business members. The rocky bluffs and serene, lush forests provide beautiful scenery from any spot on the lake. There are many secluded coves to anchor into and enjoy a day on the lake. The sunsets have been ranked as one of the most engaging sites in the state. The clear night skies afford an infinite array of stargazing, perfect for nighttime romance, sailing or hunting for falling meteors. Several marinas rent pontoons, ski boats, and wave-runners, so don't worry about missing a beat, or having to haul your boat if you live a long distance from our shores. Remember to observe all boating safety regulations, practice water safety, wear your life jacket, and be responsible, to ensure repeat visits to Oklahoma's resplendent clear water paradise. 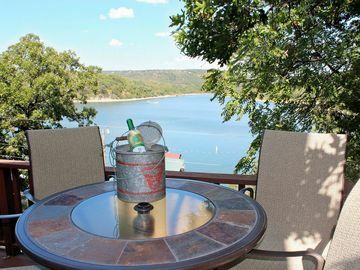 The Tenkiller area offers many resorts, cabins, condos, bed and breakfasts and hotels to choose from. The facilities range from small four or five unit operations to hotels and resorts capable of housing 300 or more a night. Visitors can choose from locations nestled in the serene setting of the woods, surrounded by nature, along the banks of the river or lake, perched high above the water on bluffs, with breathtaking views of the water, or in town with the conveniences of close shopping and dining. The facilities provide its guests with a variety of services ranging from dining facilities, swimming pools or swimming areas, boutiques, boat rentals, heated fishing docks, game rooms or video rentals. During the peak summer holidays, festivals, and events, accommodations fill up quickly, so it is always wise to book in advance. Check the calendar of events for dates to remember! Stay as many nights as you can to enjoy all the amenities that take you away from it all! You don't have to bring a grill or expect to cook over an open fire. After a day of boating, rafting, or any other strenuous fun activity, a robust appetite can be squelched by a variety of local restaurants. Whether you are in the mood for home cooking, candlelit romance, barbeque, bar and grill, Italian, Chinese, or the reliable cheeseburger, you won't be disappointed. Check the business directory for a list of business members in the area. Fishing and wildlife resources at Lake Tenkiller provide a wide variety of outdoor recreation opportunities. ​Year-round fishing is good with black bass, white bass, striped bass, crappie, catfish, bream and walleye, with rainbow and brown trout stocked in the Illinois River below the dam. The trout fishery on the river attracts many visitors, as does the Illinois River above the lake which attracts canoeists and rafters. Three heated fishing docks offer winter fun for crappie fishing. Lake Tenkiller is a popular lake for fishing tournaments. Striped bass is also common in the lower Illinois River with several state record fish coming from its waters. The current state record was caught in July 1996 by Louis Parker of Gore. Fishing is a year-round activity with each season producing its own fun and challenges. You will need an Oklahoma Fishing and/or Hunting license. Visit The Oklahoma Wildlife Department for details. Whether you choose summertime or winter time to fish, you are sure to have a good time and hopefully come home with a fish or two. Hunting opportunities are abundant around Tenkiller. This area is ranked second in Oklahoma for number of deer taken during deer season. Project lands are open for public hunting, except for developed recreational areas and lands in the vicinity of the dam and other project structures. Approximately 2,590 acres of project land are licensed to the Oklahoma Department of Wildlife conservation for a State Game Management Area. An additional attraction is the Gruber Public Hunting Area and the Cherokee Game Refuge on old Camp Gruber near the western shore of the lake. Principal game species include whitetail deer, bobwhite quail, mourning dove, duck, geese, cottontail rabbit, and squirrel. Public hunting maps showing both Corps and State area open for hunting are available from the Tenkiller Lake Project Office near the dam or from the Greater Tenkiller Area Association office in Keys. Oklahoma was in the "golf spotlight" when Tulsa's Southern Hills Country Club hosted the U.S. Open in June of 2001. OSU's own Bob Tway and Tiger Woods are just two of the notable players who have competed on this beautiful area golf course. Golf in the Tenkiller Lake community has made its own news among Oklahoma golfers this past year. Tenkiller Golf Club, located 1.5 miles east of the intersection of Highway 82 and 100, at the southeast corner of Tenkiller Lake. This course has also undergone extensive renovations in the past year, as new owners took over the former East Lake Hills golf course. Set in the beautiful Cookson Hills above Tenkiller Lake, this 18-hole championship course plays at 6,467 yards through a hardwood forest of oak, hickory and persimmon trees. These trees are part of the course, which plays to a par of 72 with a rating of 69.8 and a slope of 117. The improvements to the golf course at the Tenkiller Golf Club were more than matched by the renovation of the clubhouse into the "Duck Club." Four lanes of "duckpins' bowling have been added, hence the Duck Club name. If you've not heard of duckpins before, you're not alone. This is the first duckpin bowling club west of the Mississippi. Popular in some parts of the eastern U.S. and some parts of Canada, duckpins are played on a standard bowling lane with scoring identical to the tenpins bowling that everyone is familiar with. However, duckpins are shorter and a little fatter looking... like a duck! The big difference is the bowling ball, which with a 5" diameter, is smaller and weighs just 3-pounds-12-ounces compared to the 13 to 16 pound balls used in tenpins bowling. You would imagine that this is a popular game for seniors and young people, but aggressive and skilled bowlers will find a whole new challenge to the game. So far, no one has rolled a perfect game in duckpins! Along with this new exciting sport, The Duck Club also houses the Tenkiller Golf Club pro shop, and one of the newest and best sports bar and grills in the Tenkiller Lake area. The other golf course in this corner of Oklahoma's Green Country is Cherry Springs Golf Club, located in Tahlequah, celebrated the turn of a new century by adding nine new holes to the course. This popular and scenic championship course plays at 6,814 yards to a par of 72, with a rating of 72.8 and a slope of 127. The Cherry Springs clubhouse area has also undergone a recent renovation, including an expanded pro shop and extensive landscaping. The nine new holes have opened up the opportunity for a few lucky families to buy home sites with beautiful golf course frontage. The Cherry Springs Golf Club is located just north of Tenkiller Lake on the southern edge of Tahlequah, one-mile north of the intersection of U.S. Highway 62 and State Highway 82. The Tenkiller Valley Recreational Area, a natural scenic wilderness, is nestled in the Cookson Hills of Eastern Oklahoma. Fish and wildlife resources at Lake Tenkiller provide a wide variety of outdoor recreational opportunities - from hunting and fishing to bird watching and wildlife observation. Principal game species in the area include: whitetail deer, turkey, bobwhite quail, mourning dove, cottontail rabbit, squirrel and waterfowl. Sequoyah National Wildlife Refuge is located two miles south of Vian. The 20,800-acre refuge is the winter home for nearly a million migratory geese, ducks and other waterfowl. Winter time is also an excellent time to view bald eagles, bobcats and whitetail deer. In late September, the white pelican makes a stop here on their annual migration. Admission is free and is open to the public from dawn to dusk. Cookson Game Refuge is located five miles east of Cookson. The refuge is open to drive through traffic during August and December. Elk, deer, turkeys, bobcat, squirrels, bald eagles, rabbits and owls are just a few of the animals that can be seen. Admission is free and is open from dusk to dawn. Access by foot, horse or mountain bike is permitted Jan. 1 – Aug. 31. All access is closed to the public from Sept. 1 – Nov. 30. Tenkiller State Park Nature Center is staffed by volunteers and a naturalist and is open seven days a week in the summer. Programs on topics from birdwatching to tree identification to animal habitat are scheduled throughout the summer. Activities such as arts and crafts and games will also be available during the summer. A short nature trail is being developed that travels along a rock bluff and by the lake. Guided tours are available. Spectacular rock formations, huge boulders, and frequent glimpses of the lake can be seen a long Standing Rock Nature Trail. The trail, about 1.25 miles in length, is made up of two loops, each with two segments of shorter trails - Big Pine and Three sisters on the first loop and Big Cedar and Hi-Knob on the second loop. Much of the old world atmosphere prevails on the winding trail over hills and valleys in the Standing Rock area. The Buzzard Roost Trail at Cato Creek Landing, 1.5 miles in length, winds along a circular pathway beside a creek. It features a buzzard roost on a high bluff, a spring that was once a source of water for Indians living in the valley, an old military wagon road, and a wooden foot bridge supported by large limestone boulders. At a point one-fourth of the way to the trail's end, the two segments come within a few feet of each other allowing persons who prefer not to walk the entire trail to turn back, yet be on a different pathway. The Overlook Nature Trail is located at the Tenkiller Dam Overlook. The trail consists of two segments. The first segment of the trail, 1.25 miles in length, winds through the woods from the Overlook to Highway 10A (near the Methodist Boys Ranch). The second segment of the trail continues on from Highway 10A and ends at Strayhorn Public Use Area. The trail winds through the woods with several foot bridges, rock formations, and creeks located along its length. A variety of wildlife such as squirrels and deer are also frequently seen along the trail. Visit the Oklahoma Scenic Rivers Commission for a list of hiking trails along the Illinois River or call (918) 456-3251. Visit the Sequoyah National Wildlife Refuge or call (918) 773-5251. Visit the Tenkiller State Park for lake guided tours or call (918) 487-5693. Pictures courtesy of Ron Day Photography and Travel Oklahoma.